The 2018 NFL Draft presents an interesting group of quarterbacks at a time when many franchises are in need of a starter – and others are beginning to look to the future at the position. The resulting action from that alone should make Thursday night compelling, but we also get to see how franchises adjust their approach to a first round that is light on offensive tackle and edge rush talent. This was a fun year to mock, with a lot of intriguing team-player fits to explore. As usual, no trades are projected. Be sure to check out Walter Football for more great mock drafts. There is zero public clarity at the top of the draft, so I’m betting on Allen based on perceived long-term potential. The Tyrod bridge gives Cleveland the opportunity to develop Allen behind the scenes during the 2018 season. As laughable as the Giants 2017 season was, the team has too much talent to end up this high in the draft in the coming years. Pick the Eli successor now and figure out the rest later. After selecting a long-term QB project at one, the Browns grab an immediate contributor – and the best player in the draft – at four. Tyrod, Barkley, Landry, Gordon, and Njoku would form a strong skill position group. This feels high for Wynn, but I see him as a perfect fit for Kyle Shanahan’s scheme. The team’s main draft priority should be improving the offensive talent around Jimmy G.
This pick came down to Carter, Mo Hurst, and Da’Ron Payne. Red flags for each player aside (Carter: rawness, Hurst: medical, Payne: productivity), two things sealed the deal for Carter. One is the fact that he scored a perfect 10.00 on Kent Lee Platte’s Relative Athletic Score metric, meaning he is the most athletic player by that composite measure out of 1,479 linebackers going all the way back to 1987. It’s unusual to have that caliber of an athlete sitting around at twenty. The second factor is a gut feeling gained after watching Matt Patricia run drills at the Georgia pro day. The look in his eyes watching Carter is one of amazement, and you can see his wheels spinning around how he would teach, mold, and deploy such a unique prospect. I’m seeing a lot of Bengals-Frank Ragnow connections, but Daniels would likely be a better fit for the volume of reach blocks that will be required in the team’s new blocking scheme. Without trades, it’s tough to pair the Bills with the signal caller they will more than likely leave Thursday night with. It seems they’re gravitating toward a prototypical pocket passer type and find that here in Rudolph. Despite being a fan of Hernandez’s game, most of the guard-needy teams picking earlier run zone and I couldn’t find a great fit for him. His power blocking prowess would be perfect in Jacksonville, paving roads for Leonard Fournette. 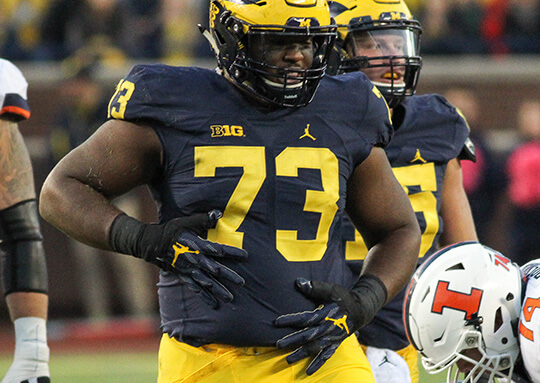 If the hero image on this page didn’t clue you in already, I LOVE Mo Hurst. He’s one of the most disruptive college players I’ve ever watched and could (and should) go much higher than this. His fall in this scenario comes after news that he’s been removed from a handful of teams’ boards (and accordingly dropped in Mayock’s usually-telling rankings).